Cervical metastasis has a tremendous impact on the prognosis in patients with carcinomas of the head and neck. The presence of neck metastasis is known to reduce survival by 50%, and the frequency of such spread is greater than 20% for most squamous cell carcinomas (SCCAs). The presence of extra capsular spread further halves the chances of cure. Predictive factors of cervical metastasis are primary site, primary tumor size, degree of differentiation of tumor, perineural invasion, perivascular invasion, inflammatory response, and tumor DNA content (ploidy). Advantages of modified neck dissection (MND) over radical neck dissection (RND) are preservation of neck and shoulder functions, better cosmetic results, protection of the internal carotid artery (ICA), and availability of simultaneous bilateral surgeries. MND offers the same survival rate and disease-free survival benefits as classic RND. 1906: Crile developed the en bloc cervical lymphadenectomy known as the RND. In his classic series, spinal accessory and hypoglossal nerves were preserved. 1945: Dargent and Papillon proposed the preservation of the spinal accessory nerve (SAN) in clinically node-negative necks. 1950: Martin popularized the RND without preserving the spinal accessory nerve. 1963: Suarez demonstrated, based on his necropsy studies, that a complete cervical lymphadenectomy could be accomplished while sparing the sternocleidomastoid (SCM) muscle, the internal jugular vein (IJV), and the SAN. 1967: Bocca and Pignataro popularized functional/conservative neck dissections. Management of a neck mass requires understanding of anatomic, pathologic, and oncologic characteristics of the tumor. Differential diagnoses of neck masses are vast and need careful consideration in all patients who present with a neck mass. Imaging is an important tool to identify cervical metastasis; however, it may not clearly identify metastatic disease in early cancers. The management of neck masses has undergone a paradoxical shift from radical neck dissections, which were performed for N0 neck masses in the early 1900s, to the present era, in which chemoradiotherapy is advocated for advanced neck disease. This change in management has been brought about by several factors, such as morbidity of the procedure, better understanding of the tumor biology, patterns of spread, and advances in radio therapy. To bring uniformity to the nomenclature for various neck dissections, the classification adopted today is the one adopted by the subcommittee for neck dissection terminology and classification of the American Academy of Otolaryngology Head and Neck Surgery in 2002. Cervical metastases, most of which originate in the aerodigestive tract, are strong prognostic factors in head and neck cancers. In the United States, the frequency of metastatic disease for the upper aerodigestive tract varies widely from 1-85%, depending on the site, size, and differentiation of the tumor. For example, larger tumors have a greater likelihood of cervical spread, and pharyngeal lesions metastasize more frequently than those in the larynx or oral cavity. Ipsilateral metastatic disease occurs in approximately 50% of patients with carcinoma of the oral cavity, oropharynx, hypopharynx, or supraglottis. Bilateral and/or contralateral metastatic disease occurs in 2-35% of these patients. Nasopharyngeal carcinoma manifests as a neck metastasis in approximately 50% of patients. Metastatic neck disease in individuals with thyroid gland tumors occurs as follows: papillary (55%), medullary (50%), and follicular (25%). Tumors localized in the oral cavity, oral mucosa, oropharynx, hypopharynx, and supraglottis have a higher frequency of metastasis compared to areas such as the superior gingiva, hard palate, and glottis. Most cervical metastases are SCCAs that originate from primary sites in the aerodigestive tract. Other sources of cervical metastasis include neoplasms of the skin, salivary glands, thyroid, lung, kidney, prostate, gonads, stomach, and breast. In some individuals, no primary cancer can be detected. In this situation, the carcinoma is labeled a metastasis from unknown origin. With oral, tongue, retromolar trigone, and tonsillar fossa subsites, the jugulodigastric, submandibular, and midjugular lymph node stations are involved. With the floor of the mouth as the subsite, the submandibular and jugulodigastric lymph node stations are involved. With the soft palate, base of the tongue, oropharynx, supraglottis, and hypopharynx subsites, the jugulodigastric, midjugular, and contralateral lymph node stations are involved. With the nasopharynx as the subsite, lymph node stations of the widest nodal distribution are involved. Contralateral metastasis is found in the supraglottis, the base of the tongue, and the posterior pharyngeal wall palate. Bilateral metastasis is found in the nasopharynx, the base of the tongue, the soft palate, the floor of mouth, and the supraglottis. The highest rate of occult cervical metastasis is found in the oral cavity, pyriform sinus, tonsil, supraglottis, and pharyngeal wall. Multiple cervical metastases (adenocarcinoma) occur with thyroid carcinoma, breast carcinoma, and nasopharyngeal carcinoma. A detailed understanding of the pathophysiology is mandatory step in the management of neck metastasis. The intrinsic behavior of any malignant tumor in the body is to grow, invade, and metastasize. Head and neck SCCs predominantly metastasize via lymphatic channels to the lymph nodes as tumor emboli. In addition, they also spread through a venolymphatic pathway. The metastatic process largely depends on various tumor factors, such as expression of adhesion molecules like CD44 by the tumor cells or host immune factors. Advances in molecular biology have given a better insight into the mechanisms involved in head and neck cancer. Multiple gene products are involved in angiogenesis, all of which are critical for regulating the angiogenic phenotype. This has raised the need for comprehensive analysis of the angiogenic phenotype using microarray analysis and global proteomic approaches. A complex interplay between positive and negative regulators determines the degree of neovascularization in and around the tumor. Various markers assessing the role of regulators have been studied. Matrix metalloproteinases (MMP) have the ability to degrade connective tissue such as the basement membrane, which is a crucial step in the initiation of metastatic process. Thus it serves as a negative regulator of metastasis. Similarly, E-cadherin is an important molecule that promotes cell-to-cell adhesion and serves as a positive regulator of metastasis. A study by Weiss et al indicated that angiogenesis and MMP and E-cadherin (M/E) ratio were specific predictors for metastases of renal cell carcinoma, especially to the lung or lymph node. Therefore, MMP and E-cadherin are considered relevant targets for novel therapeutic strategies to control or prevent the metastasis of renal cell carcinoma. These results support exploring the role of angiogenetic regulators in head and neck cancer. Vascular endothelial growth factor (VEGF) promotes angiogenesis in many different tumor types. VEGF is a highly potent angiogenic agent that acts to increase vessel permeability and enhance endothelial cell growth, proliferation, migration, and differentiation. VEGF levels may affect tumor growth, metastatic potential, and response to radiotherapy. VEGF positivity was the most significant predictor of poor prognosis. VEGF status may prove to be an important prognostic factor in head and neck cancer. In addition, the potent role of VEGF in angiogenesis has spurred interest in using this molecule as a therapeutic target in antiangiogenetic therapy. Review of the medical history should include allergies to medications, hypertension, diabetes mellitus, cardiopulmonary disease, other chronic illnesses, previous surgeries, and radiation therapy. Reviewing the use of tobacco products (smoked and chewed), consumption of alcohol, and use of betel nuts is also important. Clinical staging of cervical metastasis is accurate in 65% of cases. It understages in 28% and overstages in 8% of cases. Short neck, obesity, and prior radiotherapy reduce the physician's ability to detect metastasis. Clinical examination of the neck mass is the most sensitive parameter for assessing the operability of a neck node metastasis. The physical examination includes assessment and documentation of site and size of node, contralaterality and bilaterality, mobility, and skin involvement. In addition, examine the oral cavity and mucous membranes of the pharynx. Careful examination of the thyroid gland is essential to assess the presence of a primary carcinoma. Perform an indirect laryngoscopic examination of the larynx and the hypopharynx. If a lesion is noted in the aerodigestive tract, an evaluation under anesthesia further documents the location and size of the lesion, and it allows for a biopsy. Periabdominal examination should be performed to look for primary carcinomas in the abdomen. Perirectal/perivaginal examination should be performed in persons in whom primary carcinoma is suspected in the gastrointestinal (GI) or genitourinary tract. Perform a breast examination in selected individuals. Auscultate the chest to detect a possible pulmonary primary carcinoma. Indications for a radical neck dissection (RND) are N2 or N3 cervical adenopathy with or without bulky disease in the upper jugular region, presence of multiple lymph nodes, and residual or recurrent disease after radiation therapy. Modified RND indications are N0 neck (especially if the primary tumor is in the larynx or hypopharynx) in SCCA or melanoma, N1 neck disease, and papillary and follicular carcinoma of the thyroid. Lateral neck dissection is indicated in a tumor of the larynx, oropharynx, and/or hypopharynx staged T2-4, N0-1, and/or T1 N1 node within level I-II. Supraomohyoid neck dissection is indicated in SCCA of the oral cavity staged T2-4, N0/Tx N1 within level I-II. Bilateral procedure is indicated in anterior tongue and base of tongue cancers as well as T3-T4 carcinomas of the supraglottis. Posterolateral neck dissection is indicated in melanoma, SCCA, or another skin tumor with metastatic potential from the occipital scalp. Anterior neck dissection is indicated for thyroid, subglottic larynx, trachea, and cervical esophagus cancers. Mediastinal dissection is indicated in thyroid cancers, stomal recurrence, and postcricoid and esophageal invasion. Lymph nodes of the head are located in the occipital, posterior auricular (postauricular), anterior auricular (preauricular), parotid, facial, deep facial, and lingual regions. 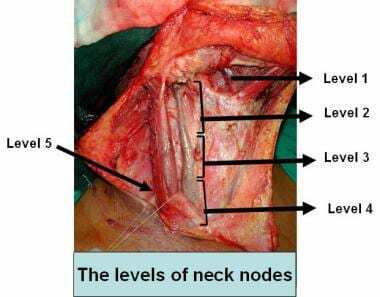 Lymph nodes of the neck are located in the superficial cervical, anterior cervical, submental, submaxillary, deep cervical, retropharyngeal, jugular, superior, inferior, spinal accessory, and transverse cervical node regions. The skin of the neck derives its blood supply from the descending branches of the facial occipital arteries and from ascending branches of the transverse cervical and suprascapular arteries; therefore, the incisions most likely to safeguard the blood supply to the skin flaps are superiorly based apronlike incisions. Level 1 contains the submental and submandibular nodes. Level 2 is the upper third of the jugular nodes medial to the SCM, and the inferior boundary is the plane of the hyoid bone (clinical) or the bifurcation of the carotid artery (surgical). Level 3 describes the middle jugular nodes and is bounded inferiorly by the plane of the cricoid cartilage (clinical) or the omohyoid (surgical). Level 4 is defined superiorly by the omohyoid muscle and inferiorly by the clavicle. Level 5 contains the posterior cervical triangle nodes. Level 6 includes the paratracheal and pretracheal nodes. The platysma is a wide quadrangular sheetlike muscle extending obliquely from the upper chest to the lower face. The skin flap is raised in a plane deep to the platysma. If the disease involves the platysma or is close to it, the platysma may be left attached to the specimen and the skin flap raised superficial to it. The SAN exits the jugular foramen (medial to the digastric and styloid muscles) and lies lateral and immediately posterior to the IJV. The nerve can also be medial to the IJV in 30% of the cases. It runs obliquely inferiorly and posteriorly to reach the SCM near the junction of its upper and middle thirds or within 1 cm of the Erb point (where the greater auricular nerve curves around the posterior border of the SCM). The digastric muscle originates from the digastric ridge in the mastoid process. The marginal mandibular nerve (a branch of the facial nerve) is the only structure superficial to the posterior belly of the digastric muscle that must be identified and preserved. It lies superficial to the 11th nerve, IJV, ICA, hypoglossal nerve, and the branches of the external carotid artery (ECA). When raising the upper skin flap or while incising the deep cervical fascia, care must be taken to identify the marginal mandibular nerve. It is located 1 cm in front of or below the angle of the mandible, deep to the superficial layer of the deep cervical fascia that envelops the submandibular gland. The omohyoid muscle has 2 bellies and is the anatomic landmark separating levels III and IV. The posterior belly lies superficial to the brachial plexus, phrenic nerve, and transverse cervical artery and vein. The anterior belly lies immediately superficial to the IJV. The posterior boundary of neck dissection is the anterior border of the trapezius muscle. The levator scapula is commonly mistaken for the trapezius, placing the 11th nerve and the nerve to the levator at risk. Dissection must be kept superficial to the fascia of the levator muscle to preserve the cervical nerves. The brachial plexus exits between the anterior and middle scalene muscles. It extends inferiorly deep to the clavicle, under the posterior belly of the omohyoid muscle. The transverse cervical artery and vein lie superficial to it. The phrenic nerve lies superficial to the anterior scalene muscle and derives its cervical supply from C3-5. Cervical rootlets must be transected only anteriorly to their contribution to the phrenic nerve. The thoracic duct is located in the lowermost part of the left neck and arises immediately posterior to the lower end of the jugular vein and anterior to the phrenic nerve and transverse cervical artery. Care must be taken to handle it gently during ligation to avoid avulsion or tearing of walls. The hypoglossal nerve exits via the hypoglossal canal, passes over the ICA and ECA, under the IJV, and loops deep to the posterior belly of digastric, where it is enveloped by a ranine venous plexus. It then travels under the fascia of the submandibular triangle before entering the tongue. The neck is divided into the anterior and the posterior triangle, each of which is divided into smaller triangles. The anterior triangle is divided into the submental triangle, submandibular triangle, superior carotid triangle, and inferior carotid triangle. The posterior triangle is subdivided into the occipital triangle and subclavian triangle. The submental node is located in the submental triangle and receives afferent flow from superficial lymphatics from the cheek, lower lip, and chin. The submandibular node is located between the anterior and posterior bellies of digastric muscle and receives afferent flow from the lower lip, sublingual area, ipsilateral oral cavity, eyelid, cheek, and nasal mucosa. The facial node is located superficial to the facial muscle and along the facial vein and receives afferent flow from facial skin, palate, and buccal mucosa. The parotid node is located in the intraglandular or extraglandular part of the parotid, and it receives afferent flow from the scalp, auricle, external auditory canal (EAC), eardrum, and the eustachian tube (E-tube). The retropharyngeal node is located posterior to the pharyngeal wall, between the prevertebral fascia and the pharyngeal wall, and it receives afferent flow from the posterior nasal cavity, palate, nasopharynx, and eustachian tube. The anterior cervical node is located in the superficial anterior jugular chain, and pretracheal, prelaryngeal, and paratracheal regions, and it receives afferent flow from the larynx, upper trachea, and esophagus. The spinal accessory node is located along the SAN and receives afferent flow from the occipital, mastoid, and maxillary sinus. The supraclavicular node is located at the jugulosubclavian junction and receives afferent flow from the spinal accessory, lower neck, upper chest, lung, and GI tract. The internal jugular node is located along the internal jugular chain and receives afferent flow from the superior nodal group, mucosal site in the head and neck, and thoracic and axillary nodes. General contraindications to surgery include too great a surgical risk because of cardiopulmonary disease and cases in which the patient cannot be optimized preoperatively. RND contraindications include the inability to control the primary tumor or distant metastasis, a fixed neck mass through the deep cervical fascia, a mass in the supraclavicular triangle, and the inability of the surgeon to completely remove all gross disease from the neck, including the skull base, vertebral fascia, carotid artery, deep muscle, phrenic nerve, and brachial plexus. Contraindications for SND are N2 and N3 disease, recurrence or previous treatment with radiation therapy, involvement of spinal accessory chain, and melanoma of clinically positive nodes. Bocca E, Pignataro O. A conservation technique in radical neck dissection. Ann Otol Rhinol Laryngol. 1967 Dec. 76(5):975-87. [Medline]. Robbins KT, Medina JE, Wolfe GT, et al. Standardizing neck dissection terminology. Official report of the Academy's Committee for Head and Neck Surgery and Oncology. Arch Otolaryngol Head Neck Surg. 1991 Jun. 117(6):601-5. [Medline]. Carenfelt C, Eliasson K. Occurrence, duration and prognosis of unexpected accessory nerve paresis in radical neck dissection. Acta Otolaryngol. 1980 Nov-Dec. 90(5-6):470-3. [Medline]. Carenfelt C, Eliasson K. Cervical metastases following radical neck dissection that preserved the spinal accessory nerve. Head Neck Surg. 1980 Jan-Feb. 2(3):181-4. [Medline]. Kowalski LP, Magrin J, Waksman G, et al. Supraomohyoid neck dissection in the treatment of head and neck tumors. Survival results in 212 cases. Arch Otolaryngol Head Neck Surg. 1993 Sep. 119(9):958-63. [Medline]. Byers RM, Wolf PF, Ballantyne AJ. Rationale for elective modified neck dissection. Head Neck Surg. 1988 Jan-Feb. 10(3):160-7. [Medline]. Sobol S, Jensen C, Sawyer W 2nd, et al. Objective comparison of physical dysfunction after neck dissection. Am J Surg. 1985 Oct. 150(4):503-9. [Medline]. Rassekh CH, Johnson JT, Myers EN. Accuracy of intraoperative staging of the NO neck in squamous cell carcinoma. Laryngoscope. 1995 Dec. 105(12 Pt 1):1334-6. [Medline]. Weiss MH, Harrison LB, Isaacs RS. Use of decision analysis in planning a management strategy for the stage N0 neck. Arch Otolaryngol Head Neck Surg. 1994 Jul. 120(7):699-702. [Medline]. Paleri V. Sentinel node biopsy in squamous cell cancer of the oral cavity and oral pharynx: A diagnostic Meta-analysis. Head Neck. 27:739- 747. [Full Text]. Mozzillo N, Chiesa F, Caraco C, et al. Therapeutic implications of sentinel lymph node biopsy in the staging of oral cancer. Ann Surg Oncol. 2004 Mar. 11(3 Suppl):263S-6S. [Medline]. Ross G.L.,Soutar D.S. Sentinel Node Biopsy in Head and Neck Cancer: Preliminary Results of a Multicenter Trial’. Annals of Surgical Oncology. 11(7):690-696. [Medline]. Medina JE, Byers RM. Supraomohyoid neck dissection: rationale, indications, and surgical technique. Head Neck. 1989 Mar-Apr. 11(2):111-22. [Medline]. Rodrigo JP, Grilli G, Shah JP, et al. Selective neck dissection in surgically treated head and neck squamous cell carcinoma patients with a clinically positive neck: Systematic review. Eur J Surg Oncol. 2018 Apr. 44 (4):395-403. [Medline]. Lee S, Kim HJ, Cha IH, Nam W. Prognostic value of lymph node count from selective neck dissection in oral squamous cell carcinoma. Int J Oral Maxillofac Surg. 2018 Mar 29. [Medline]. Shah JP, Candela FC, Poddar AK. The patterns of cervical lymph node metastases from squamous carcinoma of the oral cavity. Cancer. 1990 Jul 1. 66(1):109-13. [Medline]. Chen X, Xu J. [Clinical analysis of cervical lymph node metastasis of hypopharyngeal carcinoma]. Lin Chung Er Bi Yan Hou Tou Jing Wai Ke Za Zhi. 2011 Oct. 25(19):891-4. [Medline]. Chan JY, Wei WI. Current management strategy of hypopharyngeal carcinoma. Auris Nasus Larynx. 2013 Feb. 40(1):2-6. [Medline]. Keum HS, Ji YB, Kim JM, Jeong JH, Choi WH, Ahn YH, et al. Optimal surgical extent of lateral and central neck dissection for papillary thyroid carcinoma located in one lobe with clinical lateral lymph node metastasis. World J Surg Oncol. 2012 Oct 25. 10:221. [Medline]. [Full Text]. Hasney CP, Amedee RG. What is the appropriate extent of lateral neck dissection in the treatment of metastatic well-differentiated thyroid carcinoma?. Laryngoscope. 2010 Sep. 120(9):1716-7. [Medline]. Raffaelli M, De Crea C, Sessa L, Giustacchini P, Revelli L, Bellantone C. Prospective evaluation of total thyroidectomy versus ipsilateral versus bilateral central neck dissection in patients with clinically node-negative papillary thyroid carcinoma. Surgery. 2012 Dec. 152(6):957-64. [Medline]. Ducoudray R, Trésallet C, Godiris-Petit G, Tissier F, Leenhardt L, Menegaux F. Prophylactic lymph node dissection in papillary thyroid carcinoma: is there a place for lateral neck dissection?. World J Surg. 2013 Jul. 37(7):1584-91. [Medline]. Yu WB, Tao SY, Zhang NS. Is level V dissection necessary for low-risk patients with papillary thyroid cancer metastasis in lateral neck levels II, III, and IV. Asian Pac J Cancer Prev. 2012. 13(9):4619-22. [Medline]. Mehta V, Nathan CA. Prophylactic neck dissection in papillary thyroid cancer: when is it necessary?. Laryngoscope. 2013 Oct. 123(10):2339-40. [Medline]. Wang LY, Versnick MA, Gill AJ, Lee JC, Sidhu SB, Sywak MS. Level VII is an important component of central neck dissection for papillary thyroid cancer. Ann Surg Oncol. 2013 Jul. 20(7):2261-5. [Medline]. Stamatakos M, Paraskeva P, Katsaronis P, Tasiopoulou G, Kontzoglou K. Surgical approach to the management of medullary thyroid cancer: when is lymph node dissection needed?. Oncology. 2013. 84(6):350-5. [Medline]. Brown JS, Bekiroglu F, Shaw RJ, Woolgar JA, Rogers SN. Management of the neck and regional recurrence in squamous cell carcinoma of the maxillary alveolus and hard palate compared with other sites in the oral cavity. Head Neck. 2013 Feb. 35(2):265-9. [Medline]. Poeschl PW, Seemann R, Czembirek C, Russmueller G, Sulzbacher I, Selzer E. Impact of elective neck dissection on regional recurrence and survival in cN0 staged oral maxillary squamous cell carcinoma. Oral Oncol. 2012 Feb. 48(2):173-8. [Medline]. Brown JS, Bekiroglu F, Shaw RJ, Woolgar JA, Triantafyllou A, Rogers SN. First report of elective selective neck dissection in the management of squamous cell carcinoma of the maxillary sinus. Br J Oral Maxillofac Surg. 2013 Mar. 51(2):103-7. [Medline]. Zbären P, Schüpbach J, Nuyens M, Stauffer E, Greiner R, Häusler R. Carcinoma of the parotid gland. Am J Surg. 2003 Jul. 186(1):57-62. [Medline]. Nobis CP, Rohleder NH, Wolff KD, Wagenpfeil S, Scherer EQ, Kesting MR. Head and neck salivary gland carcinomas--elective neck dissection, yes or no?. J Oral Maxillofac Surg. 2014 Jan. 72(1):205-10. [Medline]. Klussmann JP, Ponert T, Mueller RP, Dienes HP, Guntinas-Lichius O. Patterns of lymph node spread and its influence on outcome in resectable parotid cancer. Eur J Surg Oncol. 2008 Aug. 34(8):932-7. [Medline]. Jouzdani E, Yachouh J, Costes V, Faillie JL, Cartier C, Poizat F. Prognostic value of a three-grade classification in primary epithelial parotid carcinoma: result of a histological review from a 20-year experience of total parotidectomy with neck dissection in a single institution. Eur J Cancer. 2010 Jan. 46(2):323-31. [Medline]. Schroder L, Fricker R, Stein RG, et al. Evaluation of sentinel lymph node biopsy prior to axillary lymph node dissection: the role of isolated tumor cells/micrometastases and multifocality/multicentricity-a retrospective study of 1214 breast cancer patients. Arch Gynecol Obstet. 2018 Mar 29. [Medline]. Abdul-Razak M, Chung H, Wong E, et al. Sentinel lymph node biopsy for early oral cancers: Westmead Hospital experience. ANZ J Surg. 2017 Jan. 87 (1-2):65-9. [Medline]. Brizel DM, Prosnitz RG, Hunter S, Fisher SR, Clough RL, Downey MA. Necessity for adjuvant neck dissection in setting of concurrent chemoradiation for advanced head-and-neck cancer. Int J Radiat Oncol Biol Phys. 2004 Apr 1. 58(5):1418-23. [Medline]. Connell CA, Corry J, Milner AD, Hogg A, Hicks RJ, Rischin D. Clinical impact of, and prognostic stratification by, F-18 FDG PET/CT in head and neck mucosal squamous cell carcinoma. Head Neck. 2007 Nov. 29(11):986-95. [Medline]. Wee JT, Anderson BO, Corry J, D'Cruz A, Soo KC, Qian CN. Management of the neck after chemoradiotherapy for head and neck cancers in Asia: consensus statement from the Asian Oncology Summit 2009. Lancet Oncol. 2009 Nov. 10(11):1086-92. [Medline]. van der Putten L, van den Broek GB, de Bree R, et al. Effectiveness of salvage selective and modified radical neck dissection for regional pathologic lymphadenopathy after chemoradiation. Head Neck. 2009 May. 31(5):593-603. [Medline]. Rao VU, Shenoy AM. Adjuvant neck dissection after chemoradiotherapy. Lancet Oncol. 2010 Mar. 11(3):223-4. [Medline]. Byers RM, Clayman GL, McGill D, et al. Selective neck dissections for squamous carcinoma of the upper aerodigestive tract: patterns of regional failure. Head Neck. 1999 Sep. 21(6):499-505. [Medline]. Andersen PE, Warren F, Spiro J, et al. Results of selective neck dissection in management of the node-positive neck. Arch Otolaryngol Head Neck Surg. 2002 Oct. 128(10):1180-4. [Medline]. Muzaffar K. Therapeutic selective neck dissection: a 25-year review. Laryngoscope. 2003 Sep. 113(9):1460-5. [Medline]. Bailey BJ. Head and Neck Surgery-Otolaryngology. 2nd ed. Baltimore, Md:. Lippincott-Raven. 1998. Hart RD, Nasser JG, Trites JR, Taylor SM, Bullock M, Barnes D. Sentinel lymph node biopsy in N0 squamous cell carcinoma of the oral cavity and oropharynx. Arch Otolaryngol Head Neck Surg. 2005 Jan. 131(1):34-8. [Medline]. Lindberg R. Distribution of cervical lymph node metastases from squamous cell carcinoma of the upper respiratory and digestive tracts. Cancer. 1972 Jun. 29(6):1446-9. [Medline]. Meyers EN. Operative Otolaryngology-Head and Neck Surgery. Philadelphia, Pa:. WB Saunders Co. 1997. Nieuwenhuis EJ, van der Waal I, Leemans CR, et al. Histopathologic validation of the sentinel node concept in oral and oropharyngeal squamous cell carcinoma. Head Neck. 2005 Feb. 27(2):150-8. [Medline]. Roy PH, Beahrs OH. Spinal accessory nerve in radical neck dissections. Am J Surg. 1969 Nov. 118(5):800-4. [Medline]. Schwartz DL, Ford E, Rajendran J, et al. FDG-PET/CT imaging for preradiotherapy staging of head-and-neck squamous cell carcinoma. Int J Radiat Oncol Biol Phys. 2005 Jan 1. 61(1):129-36. [Medline]. Anatomy following a Type III modified neck dissection.